P.S. thanks for all the well wishes from last week's love note, things are moving along in regards to the new space and maybe I'll have a solid update to share next week! Through movement, we are able to remember our essence is inherently wise, wild and free. A physical sensation of truth emanates through our bones and breath that feels like resonance. 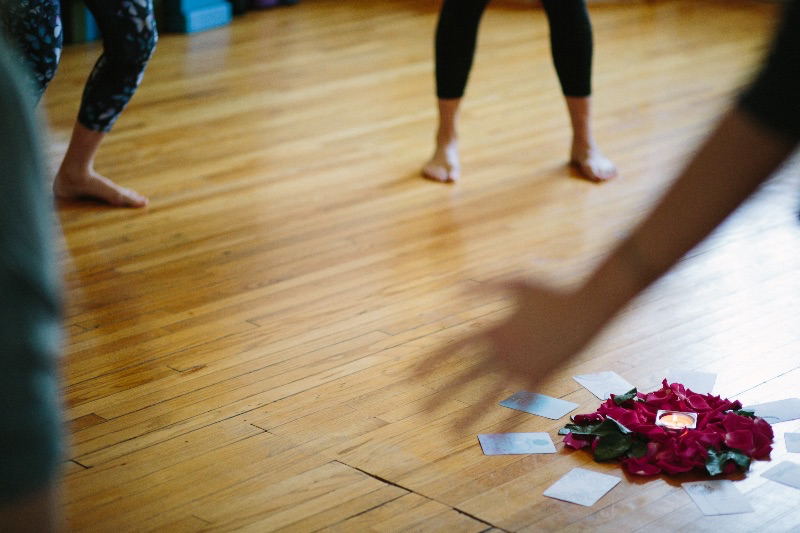 There is class tonight at 7pm in Wolseley! Save your spot here. I am in the midst of waiting to hear if we've found the building that will become the home for the next incarnation of my work here. I've done as much as I can do on my end and now...I wait. This feels like a familiar place, this place of waiting, but for the first time my hands are not clenched and my stomach is not in knots. I've moved through anxiety and now here I am, curious and open again. My ego says, "Don't tell people that you might have found it! What if it doesn't work? Be sure and then share!" Which makes my soul chuckle and say, "What if what doesn't work? This building? Then it wasn't the building. And anyway and there is no such thing as failure here. It's all just life." This feels revolutionary for me to feel. Today my prayer has been a section of the prayer used in Qoya to open sacred space, I've said it while driving, walking, working and waiting today. I'll share it with you here, so that in the midst of it all we maybe we can remember the sacred pulse of life and how it dances through us. Whatever happens next, and trust me something will happen, I hope we have the courage to meet it. Because after all, what else are we here for? Qoya is tonight at 7pm! Thank you for all the responses from last week's love note! I loved receiving responses from so many of you about how the information really resonated or interested you too. This week I've recorded a short meditation to add a little moment of remembering into the day. I am all about finding small and manageable ways to create space and breath amidst a day. And here's one! I have no fancy sound equipment so it's just my voice as I do my best to sit still and breathe silently (haha!). But maybe, like me, it's just what you need today too. It's only 6 minutes and offers a simple check-in. You can access it here. Where ever you are, wishing you a moment to pause and breath deeply. 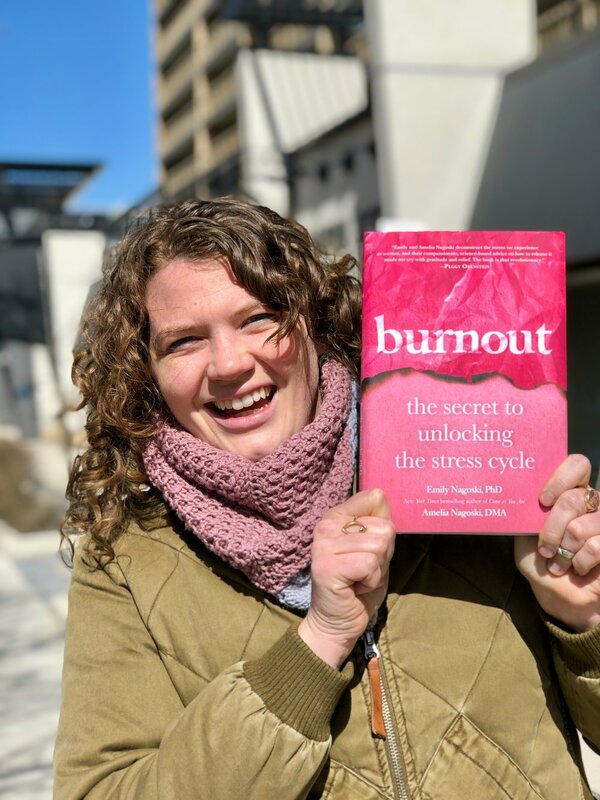 Last week the book Burnout by Emily and Amelia Nagoski was released. I have been waiting for this book for months now. Some of you will have heard me talk about it before - I just love learning about how our nervous systems work! And I especially love learning ways we can do to support them when they are freaking out. I've been following Emily Nagoski's work for a few years now. I love and highly recommend her first book, Come as You Are, which is about female sexuality and is so insightful. She combines science and heart in a way that makes her books both fun to read and inspiring. Back to this newest book though, she combined forces with her sister to explore the stress response cycle and work with burnout (emotional exhaustion). I've sometimes talked about this at Qoya, especially when related to why we shake in each class. It turns out our bodies can't tell the difference between being chased by a lion and having a hard conversation with another human. They have the same biological effect - a cascade of hormonal and neurological activity all designed to help you survive . And no amount of logic or self-talk will complete this cycle or convince you you're not in danger. Because it's happening in the body, you have to speak the body's language to complete the cycle. What is the body's language? Movement! We need to move our bodies to give ourselves the signal that our bodies are a safe place to be again. Shaking, dancing, walking, or simply tensing our bodies and then relaxing them are all examples they give. They suggest alternatives to movement, but movement always comes out on top as the most efficient and effective way to complete the cycle. This is one of the reasons I love Qoya, because it does this so so well. Movement is medicine. I heard Emily say the above on a podcast and it made me realize another layer to why Qoya is so important to me and why creating space in my week for intentional time with others is also so important. Moving your body in time with others is on par with sleeping when it comes to recovering from burnout, emotional exhaustion and feeling stressed. Whoa! I haven't even finished reading Burnout but I highly recommend tracking a copy down and doing your own reading and reflecting. Can you imagine how amazing it would be if we could all be more conscious about completing stress cycles?? I love remembering that my very primal nervous system is always just trying to do it's best to keep me safe, even if it doesn't know the best way to do that. And that's when I love that my prefrontal cortex does know! And so I get to choose. Choose to shake, breathe and connect or choose to ignore my tense shoulders, my tense tummy and tell my nervous system to "get over it." One of those choices is so much more effective than the other. I'll be at Qoya tonight, recharging my battery, and maybe you will be too! But if that's not an option for you, there are so many other ways to move your body, I hope you find one that feels good and is accessible for you to do today. I'm going to go shake now, because sometimes I feel vulnerable writing and sending out these notes - cue a mini stress response! This week is World Doula Week which feels like the perfect time to share a little more my work as a doula! Doula's have been attending birth since...forever. Doula (doo-lah) is a Greek word that means "servant to women" or "mothering the mother." Across time and cultures this type of support has existed. 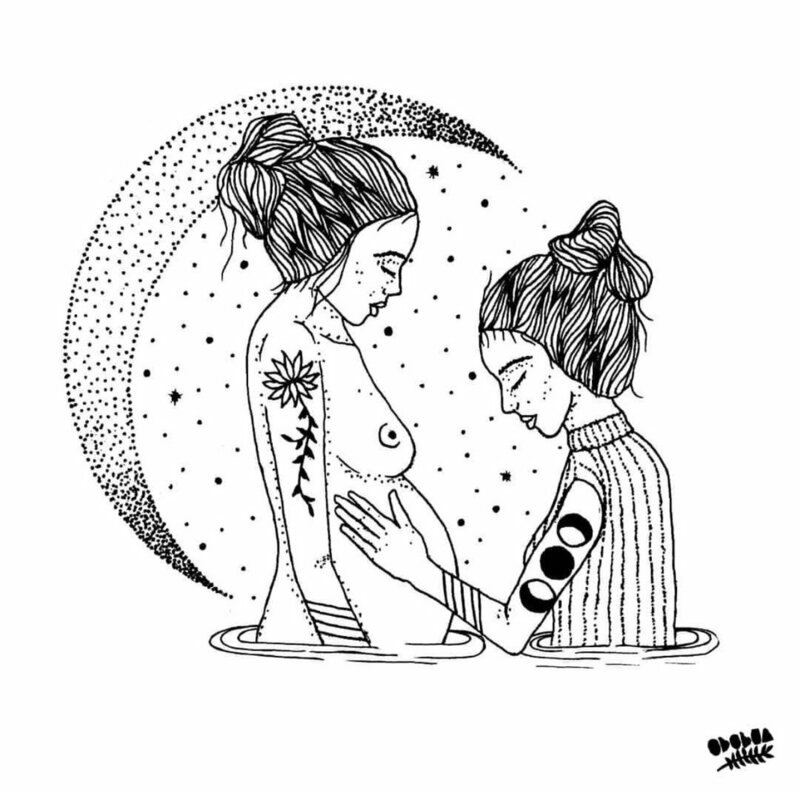 We expand that definition these days to say that a doula supports a birthing person (and partner) though the process of pregnancy, labour, birth and postpartum. That's really simplified, but hopefully you get the idea! Doulas are a form of pain relief in themselves (Hofmeyr, 1991). Having continuous labour support and someone who is present solely for the birthing person and who can support their needs turns out to be pretty important!! We know this because of evidence, but we also know this from experience - whether you've given birth or not - the impact of having someone be with you through a big life event makes a huge difference. I answer a bunch of questions about doulas on my website (like what's the difference between a midwife and doula??) and you can read that here. I became a birth doula about 2 years ago, you can see from this photo I am very pleased. I was just following the little nudges I get from the inside and signed up to take the training. As it goes with nudges, it ended up opening up so much more than I would have ever guessed. I can see that now! This is where I could go on a tangent about the importance of support and education. But, I'm not gonna! You can ask me all about it in person, haha! I will say this though, it is my wish/prayer/hope as a doula and a human that we remember how significant the experience of giving birth is to a woman, and how significant the experience of being born is to a baby. It matters. And it has an impact. I am so grateful to be able to be with families in this way and to advocate for births that revolve around options, support and respect. Thanks for reading and if you have any questions about doulas or the work I do as a doula, please ask me! Here's to more births that include continuous support!! P.S. There is no Qoya tonight! The next class is April 3rd. Sign up here. Happy Spring & full moon love to you! I am popping into your mailbox to say "hi" before heading to Day 2 of a workshop on building attachment with kids and youth who have experienced trauma and chronic stress - it's blowing my mind. I am looking forward to incorporating these teachings not only into my work but also into my life. Have I mentioned I love learning?? There is Qoya tonight and Sunday morning this week, sign up here. Ooh, yes. Waking up to the heart this morning. May we turn towards the sun and feel supported by the moon today. Fertility Awareness with Nathalie Daudet! 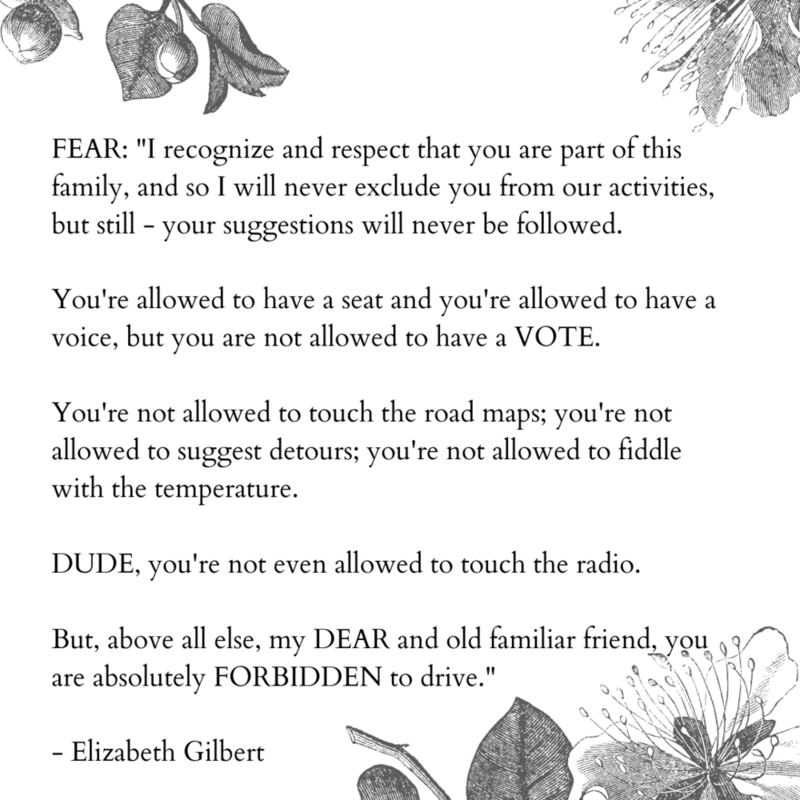 I was laughing at myself this morning as I sat down to write because I realized it would be equally as accurate to call these emails Fear Notes! It would probably be less enticing...or maybe it would be more!! Considering last time I checked, fear was a very human experience. As I continue to move forward with everything, I am reminded on a daily basis of my choice to let love be the boss of me and not fear. This goes against many things in me and around me. And yet, I know in my bones I am here (and probably you are too) to transform fear and become even more of an embodiment of love. This sounds beautiful and feels SO messy. 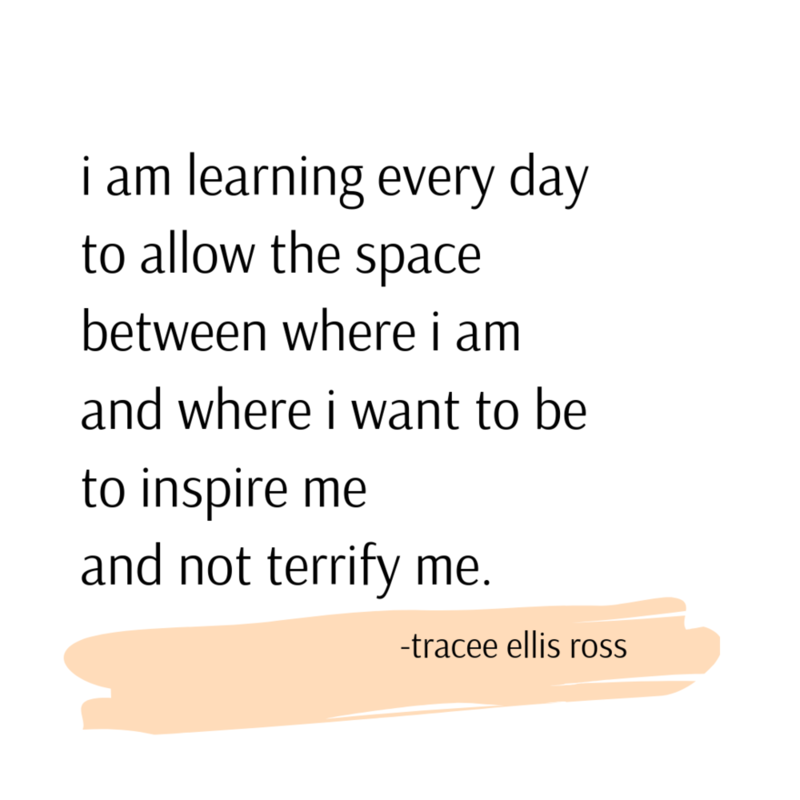 My go-to remedy for working with fear (or anything!) is always going to be movement. Even a 5-second whole body shake. May I suggest we all turn on our current favourite song to dance to and give ourselves some medicine via movement. If you'd like something more guided, check out this shaking video on the Qoya website. Or come shake in-person at tonight's Qoya class! Even the smallest choice for love is a step in the best direction. Today I'm working with the above words. I pulled an oracle card this morning as I sat down to begin work and that sentence jumped out at me. One of my intentions this year (and last year!) was to cultivate expansion in my being and life, especially when it feels "safer" or easier to contract. As with everything, it's a practice. And I am grateful for the reminders that encourage even the smallest amount of movement towards expansion, towards love. This past Sunday we gathered for the first Wilder Roots day retreat and the first time my mom, Jane, and I collaborated. The day was beautiful. I looked up many times during the day and my heart nearly burst with gratitude. It reminded me of this question: Remember when you wanted what you currently have? As a person who is very future-orientated and always thinking "what's next?" it was a huge gift to be able to realize how much magic was and is in the present moment. I have no doubt there will be future day retreats and I look forward to sharing more about that. This month marks the 10 year anniversary of Qoya! Rochelle Schieck, Qoya founder, lead the first class in New York City in March 2009. 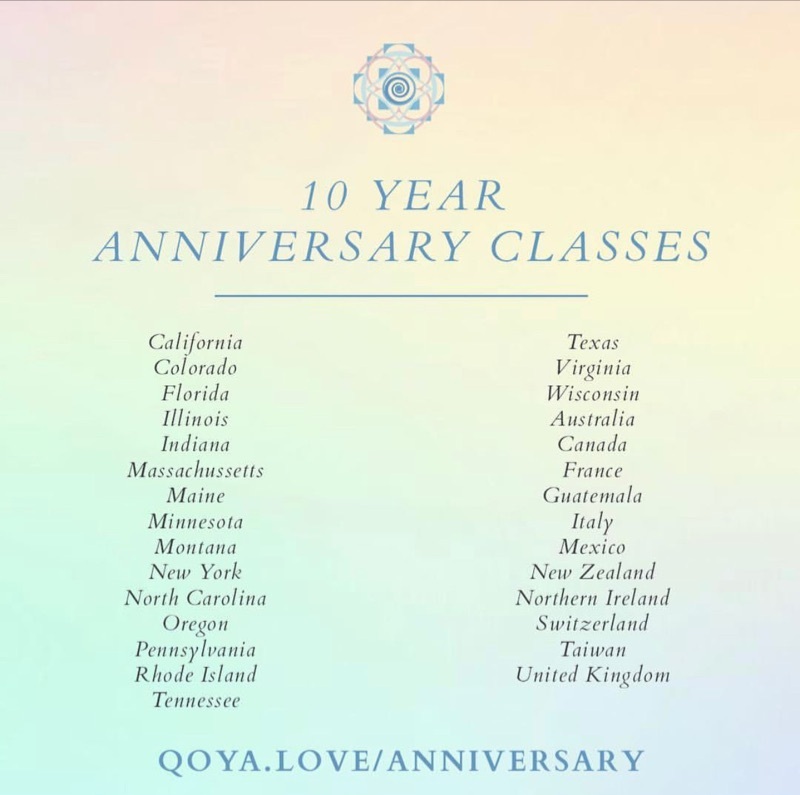 To celebrate, Qoya teachers from all over the world are teaching a class in March to celebrate Qoya! I am teaching tonight in honour of this occasion, if you'd like to join us, save your spot here. I also encourage you to check out the full list of the classes being taught this month. It's amazing to see all the places Qoya is being offered and if you know of anyone who might be interested in one of the cities listed maybe you want to spread some Qoya love and share it with them! Sending love out to you via my finger tips tapping these words out. Today may we all choose to take a step towards love, small or big. Thanks for sticking around! It's been so good connecting with you all this way. Thank you for all the messages, in person or via email, in response to them. It means a lot! Today I wanted to check in about the topics of these notes and hear from you! Is there anything you'd love to read about in these emails? Any questions you have about me or Wilder Roots? Or topics you'd be interested in me sharing about? I'll continue to shower your inbox with love and the things I'm into...but I'm open to anything you're curious to hear about from me as well! If I know it, I will share it. Comment below if you want! You may just inspire next week's love note! I hope wherever you are right now you can take a deep breath, I'm taking one with you. P.S. It's Wednesday...which means there's Qoya tonight! Save your spot here. Coming to you live from the working room floor. The working room floor being my life, ha! I was walking with a friend today and we were sharing where we are being led and encouraged to grow and I asked if she had heard that cheeky love note from the universe that goes like "yo, I heard you like growth so I put some challenges on top of your challenges so you can grow from your challenges while you grow from your growth." Yup. We laughed - some of the best medicine for this work called life - and then kept walking. I love that life continues to give us opportunities to show up. To try again. To do it differently. To choose to remember. To break open. To become even more of an embodied human/spirit. Life, please don't stop. This good-hard work. Wishing us all the courage to continue to show up. To gather the support we need to be able to be who we came here to be. To let go of what we know it's time to let go of. Remember in the cycle of Life-Death-Life...life always follows death. There is Qoya tonight at 7pm at R.A. Steen CC, sign up here. 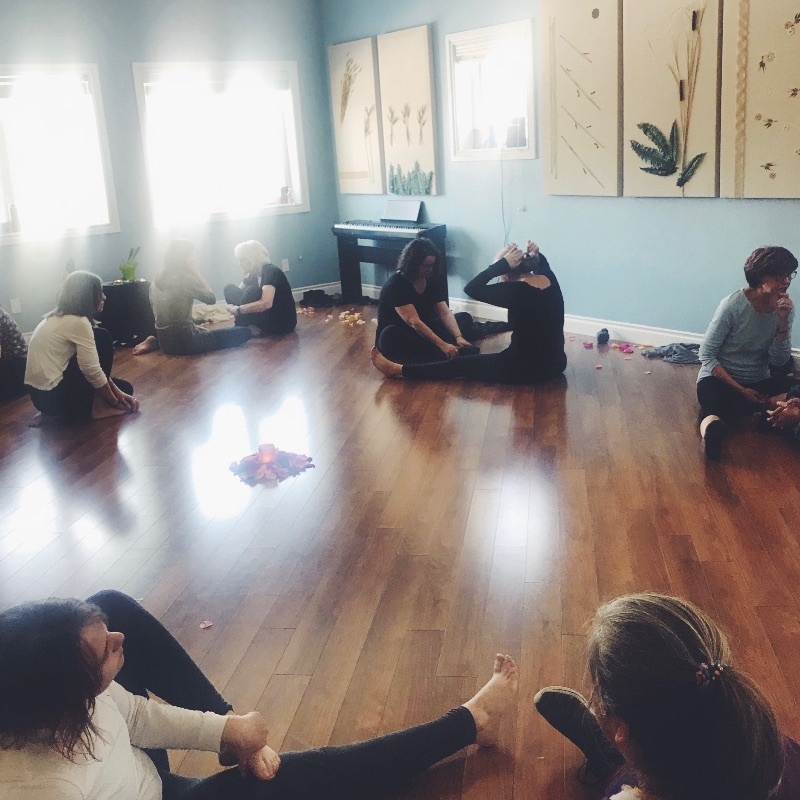 And there are still a couple spots left in the day retreat on March 3, 2019! Learn more about that day here. I hope wherever you are in your day you can give yourself a couple deep breaths. P.S. There is Qoya tonight at 7pm! Sign up here. Join us for the Wilder Roots day retreat! March 3rd, 2019 at Light of the Prairies. 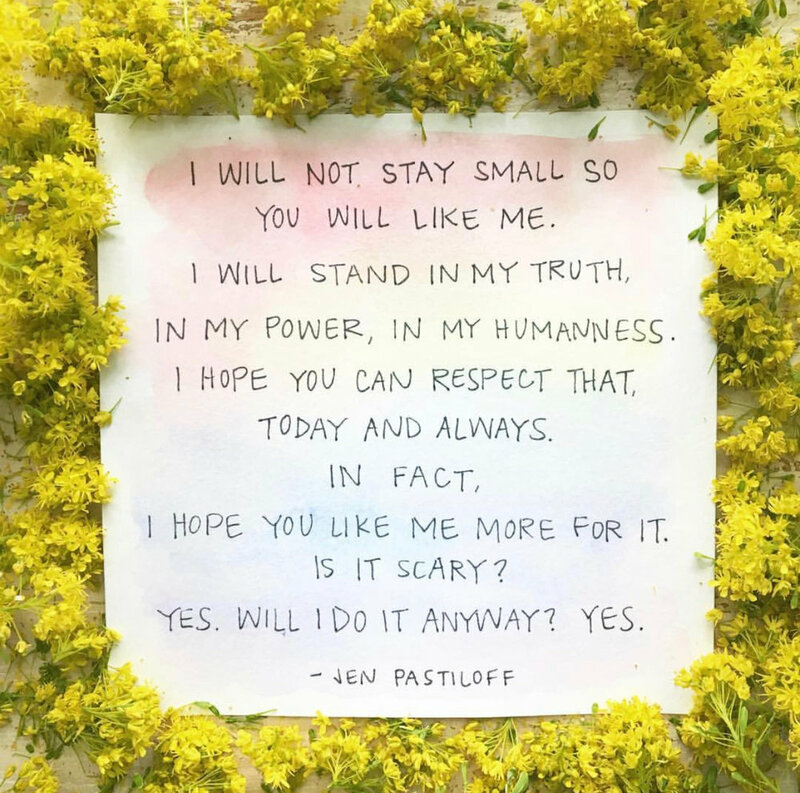 On Monday I had a business meeting and right before I walked in I pulled a card that said "I am fearless." I gave myself a couple breaths to listen to what that was telling me in the moment. Fearless. Fear-less. To have a little less fear than courage. Ahh, I can totally do that. And so I got out of the car and showed up. And now, I can't stop thinking about fear-less. I am fairly certain I'll never not have fear. And I am positive that waiting to not be afraid should never be the barometer of whether I am ready to do something...because I might be waiting decades for my tiny ego-mind to deem us ready. And so, today I am choosing to remember how my fear so clearly highlights what is important to me. What I want to create. Hey Fear! That's actually pretty good. Maybe I even need to say "thank you" for waking me up to the importance of who I am and what I am creating. And if I'm not waiting to be unafraid anymore...then...let's do this. May we all feel the strength and support to face our fear. And realize how it illuminates what is so deeply important to us. To be tender with ourselves in those moments of fear, as we realize just how important something is to us. And then may we take it step further and be fear-less. Just for a moment, we might realize we have just a little less fear than the desire to create and be. We still have a few spots left in the day retreat next month! If you have any questions about this day please reach out. You can learn more on the website. 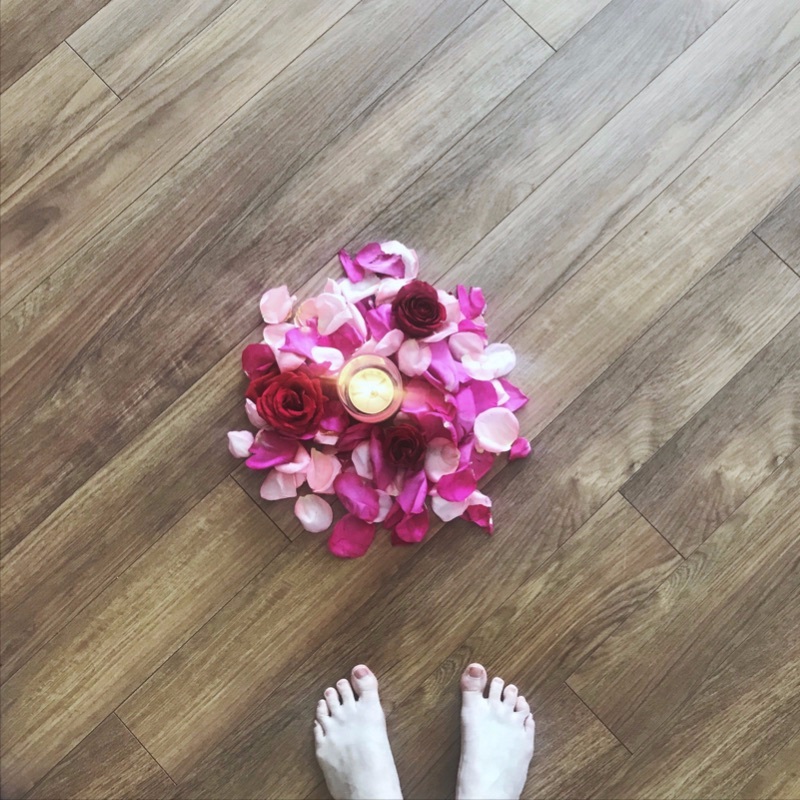 Last week I shared a little about an upcoming day retreat I am offering this March, and today I'd love to share a little bit more about it. 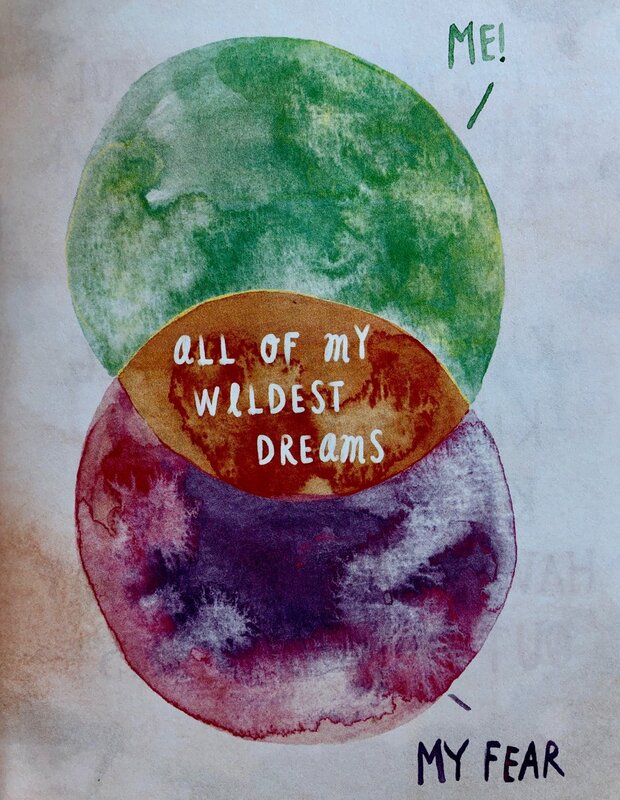 One of the things I realized pretty quickly as I began moving forward with finding a physical location for Wilder Roots is that I got easily overwhelmed and forgetful when I focused so intensely on making plans, loan applications and all the business stuff. I say "forgetful" meaning that I would forget the why. In Qoya we often say "Are you in the remembering or the forgetting?" instead of "How are you?" Because as we know, life can be hard and we can be connected to our truth, but it can also be hard and we can be forgetting our truth, this makes for two very different experiences of our circumstances. As soon as I realized this pattern of forgetting as I focused on the "how" of moving forward, I knew I had to make sure I was supported with the medicine to remember the "why." And what is the medicine? It is to do the work that I love, to be actively learning and creating. It means moving forward in the business world at the same time as I move forward creating, and learning about, the things that I love. One of my favourite things is to create opportunities to be in circles of women. To dedicate a whole day to remembering. And that's what this day retreat is. An invitation to gather and set the conditions for listening to what is stirring in you. We will do Qoya, receive a teaching, eat nourishing food and have time for reflection and quiet. So, here I am. Listening to the pull to create a day retreat, to dedicate myself to what I love. And guess what? This medicine is really working for me! I asked my mom, Jane Powell, to co-create this offering with me. For those that don't know her, she is a wise woman, BodyTalk Practitioner and Spiritual Director (among things!). I think we make a pretty great team and I am so looking forward to this collaboration. Maybe this sounds like good medicine to you too... Registration is now open on the website. Please reach out if you have any questions. I am sitting in front of the kitchen window watching the snow fall and writing to you. I've had a month of writing these love notes now and have to give all the credit to my hips for suggesting this move to weekly emails, its been the best. Thank you for being here. I am taking a break from writing a business loan application to write to you. It's been a growth edge for me to translate my language of feeling and heart into the language of cash flow and key competitors. Huge shout out to my brother Zachary for spending an afternoon translating my heart words into loan application words. But it's been good. It's given me the opportunity to get even more clear about this next step, and while the "how" still isn't figured out yet, the "why" most certainly is. This is an actual screen shot of one of the pages of the application. I had to put my true daily mission for the work I do first, and then almost like layers of paint on a canvas I'll write the daily mission that will be submitted on top. I realized this line from a Hafiz poem was my daily mission after I came back from San Diego this past November. I took the trip to learn from an Indigenous midwife who teaches a workshop on traditional postpartum sealing practices, which are practices meant to care for women after birth to support healing. I had heard her interviewed on a podcast the previous May and immediately emailed her to see when her next workshop was. And so I found myself here. Yup, that's me lying down, experiencing the closing of the bones, one of the practices incorporated into a postpartum sealing. I have experienced many transformative and amazing moments, workshops, retreats, trainings in my life so far, and this one was intense and exceptional. Personally and professionally, it has changed so much for me. I am still processing and uncovering pieces of myself that were initiated through that weekend. But one of the biggest things has been wanting to show up for my clients (and everyone!) with the commitment to lean my heart close to theirs, whether they are seeing me for BodyTalk, in Qoya or in a birthing room. This is sometimes hard to do in a western system! To be able to show up that way requires supporting yourself very well. But at that workshop I caught a vision, I lived an experience of that type of care. And that is my vision for my work now. "The secret ingredient is love, if you don't have that...reschedule." What? I am allowed to do that? Yup. That felt like a revelation itself. I couldn't really imagine rescheduling, but I loved what was behind the statement, and so I sat with what is required for me to show up consistently with love. And the answer was care. My heart needs care to be able to lean towards your's in the most healthy way. And you know me, once I know something I can't easily un-know it. And so I try to remember this when I make my schedule. Where is your care? It needs to be as much of a priority as your work. That Hafiz poem, that vision of mine, is just as much a commitment to you as it is to myself. To show up for you, I will, I must, I am required to show up for myself. I am by no means perfect at this. I am still very much a work in progress. I plan on being that way for the rest of my life. And a masterpiece. Simultaneously. P.S. Qoya tonight! Feeling moody? Come and shake your booty. Save your spot here. I am co-creating a day retreat for women with Jane Powell, wise woman and my mama, in March, stay tuned for updates! It will be a day to reconnect and remember. I'll let you know when registration is open, but if you're interested, pencil it in and keep your eye out for more details coming next week! My intention this week has been to rededicate. Rededicate myself to the practices that bring me home. To how and where I show up. And what is the priority right now. I read once that it can be such good medicine to forget to do the things we do to keep us well, because it gives us the opportunity to remember why the practices are so important in the first place. I like to remember that idea as I make the choice to return. That it's okay to forget and that remembering is only a breath away. I've come back to my most trustworthy practices this week which centre around actions that nourish my body, mind, heart and spirit. All of which cost nothing but time. The etymology of the word "dedicate" tells us that to dedicate means to set aside and name something as having sacred purpose. Ahh, yes. Choosing to set aside time to the sacred purpose of remembering why I am here and what is important. Rededication. There is a cue in Qoya that is often said during the free dance, the cue is "Take a deep breath and rededicate yourself to this free dance of ________." (fill in the blank with which ever theme we're dancing with that class). That's only about 2.5 minutes after the initial cue to dance whatever the theme is...and yet, you can feel the renewed purpose in the room when that cue is said. Can you imagine how we would move through our days if every 2.5 minutes we asked ourselves to take a deep breath and rededicate ourselves...to love? To trust? To courage? To whatever is your current guiding light? Whoa. Sign me up. and let yourself begin again, rededicated to your intention. May we allow that to determine our choices today and every day. P.S. Turns out my writing wasn't all together clear last week! I am not signing a five-year lease at my current office. I am creating a new space that includes a studio and offices. Stay tuned for updates! For those that don't know yet, part of this upcoming year is finding a permanent home for Wilder Roots, a healing space that will include a studio and offices. This has been on my radar for a few years but really solidified this past June. The first time I said it out loud was actually in a Qoya class a couple years ago. 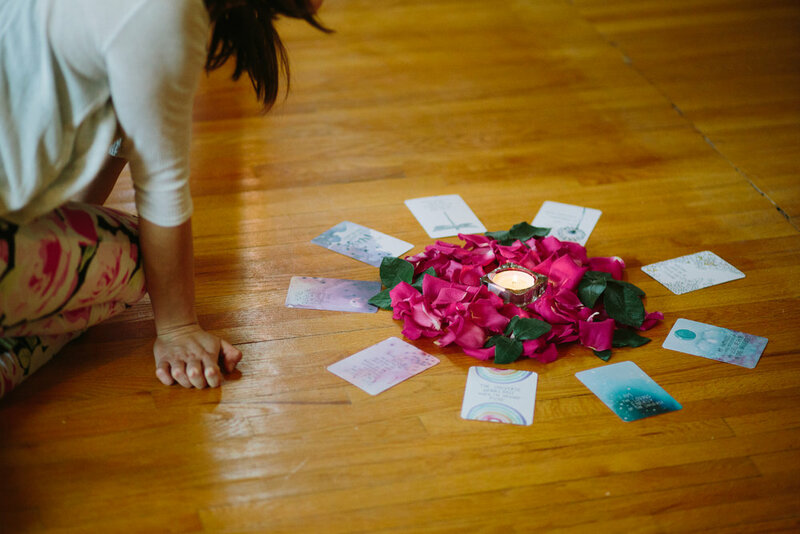 I was sharing with my partner in the class how I was struggling with finding a beautiful and functional space for Qoya classes, by the end of that class I said to her, "I know why I can't find a space...I am meant to create it!" And then this summer our lease was up at the office I work out of, the owner wanted us to sign a 5 year lease. The first thing out of my mouth was, "I can't sign a lease for 5 years, I'm having babies in 5 years!" Umm, what? Where did that come from? I don't usually give desires such linear time frames. But that was a pretty clear (and bold!) statement. And I realized it actually felt like truth. And once I felt it, I couldn't un-feel it. And so I am saying yes. 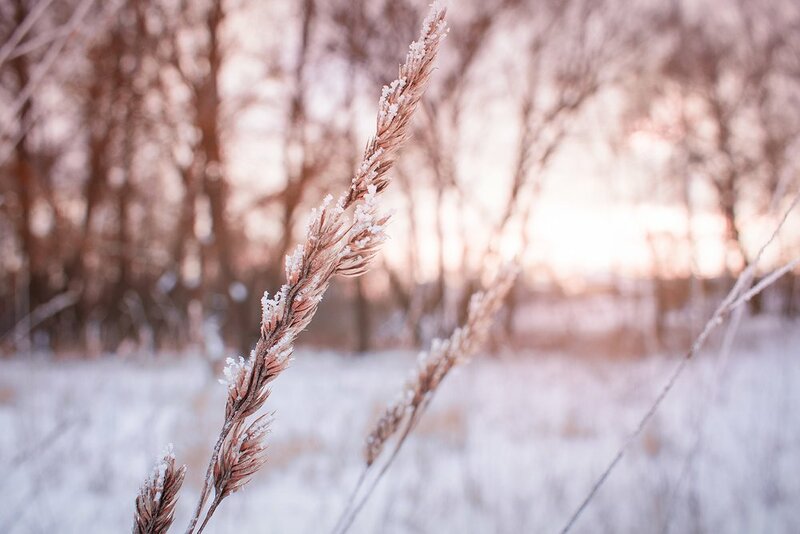 As Rochelle shared in the latest Qoya New Moon email, "I wonder what it would be like to give yourself permission to really align with the soul call you feel. The thing that brings vitality to your being." I am saying yes, even though I don't have the whole "how" figured out. I'm saying yes, knowing I will be asked to show up even more. I'm saying yes, because I trust this heartbeat. To the next right thing, one thing at a time. Love is the boss. Thanks for being here with me. For sitting with me in "yes." May we all feel the courage and commitment to follow our heart's calls. I mean, as long as we're here, why not? Qoya is tonight! 7pm at RA Steen CC, save a spot here. Show up and see what happens when you give your body the time and space to be listened to. I am beginning 2019 by changing things up, no longer will Wilder Roots be on Instagram and instead weekly love notes will be sent out sharing what's new within Wilder Roots and my life. During the free dance portion of the class I asked my hips (they are after all where the power lives!) what I needed to do to move forward with my work and the message I received while dancing was to move away from Instagram. In the moment I thought, "Okay, sounds alright!" and kept on moving. It was only afterwards that I started to get a little concerned. How could I not have social media for a business in the 21st century? But here's the thing, once I hear something from the inside I can only go so long without doing something about it. Someone asked me this month about my intuition and how I continue to fine-tune it, and my answer was that I commit to following through on what I hear/feel. And so I knew I had a choice to make, and honesty, once I remembered it was my choice it wasn't that hard to make. And here we are! I am choosing to share my work and my life in a more personal way via these weekly emails. Sometimes they'll be short with a simple reminder or question. And sometimes they'll be sharing what's upcoming at Wilder Roots or what I'm currently learning. I know you might get a lot of emails already, and so if me showing up once a week is too much for you, no worries, these emails will all be saved on the website for you to access. Thank you for being here. Thank you for supporting me and my work. I am so looking forward to co-creating some magic this year. P.S. Tonight is the first Qoya class of 2019! If you feel like dancing tonight...save a spot by clicking here. 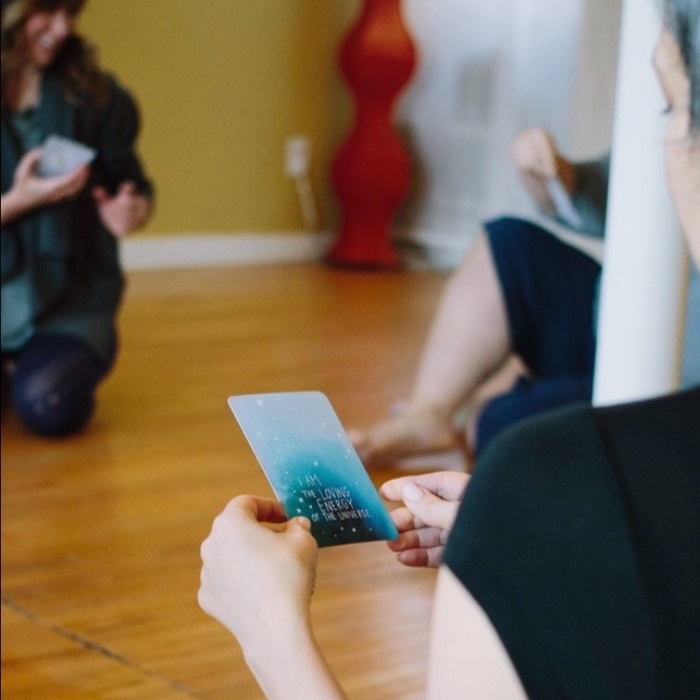 Check out the Wilder Roots website to see the new dates for Qoya this winter, book a BodyTalk session or learn what a Doula is!